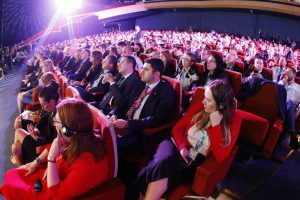 The Digital Assembly #DA18EU in Sofia, Bulgaria, on 25-26 June, helped raise the spotlight on digital skills for all Europeans. The Digital Assembly is a regular assembly organised by the European Commission DG Connect and takes place in the country which hosts the European Council Presidency at the time. It is an event where stakeholders in digital policy from around Europe meet and collaborate to work on developing a stronger and better Digital Europe. 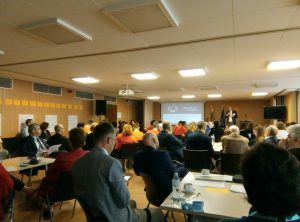 Before the Assembly started, there were many stakeholder meetings with groups ranging from the Digital Champions, the Governing Board of the Digital Skills and Jobs Coalition, Code Week EU Ambassadors, and National Coalitions. 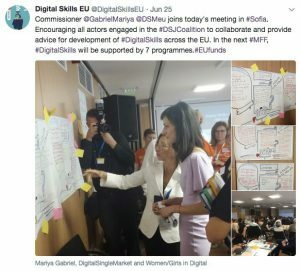 On 25 June, a meeting between all groups took place, marking the first time the Digital Champions, the Governing Board of the Digital Skills and Jobs Coalition, Code Week EU Ambassadors, and National Coalitions took place. ALL DIGITAL along with DIGITAL EUROPE and European Schoolnet form the secretariat of the Digital Skills and Jobs Coalition. ALL DIGITAL’s main mandate is scaling up and supporting the National Coalitions for Digital Skills and Jobs. ALL DIGITAL also makes a pledge to the Digital Skills and Jobs Coalition through its ALL DIGITAL Week initiative. Furthermore, many National Coalitions are coordinated by members of the ALL DIGITAL network, such as the National Coalition in Estonia coordinated by Vaata Maailma, in Lithuania by Langas i Ateiti, in Latvia through LIKTA, in Portugal with FCT, and many members are active members in their National Coalitions. The Digital Champion from the Netherlands Tinneke Netelenbos comes from ALL DIGITAL member ECP. The meeting was extremely valuable for raising the priorities of all stakeholders in ensuring the goals and ambitions of all groups are met. Of importance in this meeting was the inclusion of Code Week Ambassadors whose work is primarily highlighted during the two-week Code Week campaign which takes place every year in October. Their work throughout the year however works to ensure coding reaches 50% of European Schools. This ambitious target needs more collaboration from all stakeholders in the field to ensure the message is reached. Marc Durando of European Schoolnet who serves on the Governing Board of the Digital Skills and Jobs Coalition alongside ALL DIGITAL Chair Mara Jakobsone presented a draft action plan of the Digital Skills and Jobs Coalition featuring Nine Key Actions. ALL DIGITAL encourages all stakeholders to continuously empower and support National Coalitions in Europe, and the Digital Skills and Jobs Coalition and its objectives going forward. Futhermore the ALL DIGITAL network supports coding, and even published a position paper on occasion of EU Code Week, stating that “coding should have a broader audience and be accessible to everyone, including disadvantaged groups, and that this can better be achieved through non-formal training”. During the meeting stakeholders were invited to initiate and lead a discussion on any topic they find relevant in the field of Digital Skills and Jobs, by writing a discussion topic on a post-it and leading the topic for an hour along with any stakeholder who found it interesting or relevant to their work. Topics of discussions ranged from raising the number of women in ICT professions, preventing Brain Drain and attracting IT professionals to develop a growing IT economy, artificial intelligence, mainstreaming digital skills, and also the Digital Agenda for the Western Balkans. The discussions were presented to Commissioner Mariya Gabriel who said she would keep the posters in her office as inspiration and policy recommendations. The Digital Assembly was also the scene of two agreements between countries, the Digital Agenda for the Western Balkans wherein the Commission together with Ministers from six Western Balkan countries – Albania, Bosnia and Herzegovina, Kosovo, Montenegro, the former Yugoslav Republic of Macedonia and Serbia – commit to: Investing in broadband connectivity, Increasing cybersecurity, trust and digitalisation of industry, Strengthening the digital economy and society, and Boosting research and innovation. And an agreement of intent was signed to form a digital corridor between Serbia, Greece and Bulgaria in field of connected and autonomous vehicles. 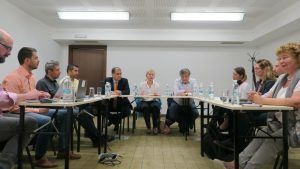 Following the Digital Assembly, the Board of ALL DIGITAL held a meeting during which they also meet the local member of ALL DIGITAL in Sofia, Global Libraries – Bulgaria Foundation. The foundation managed to raise the number of member libraries they have in Bulgaria from 960 to 1000 in the last year. The executive director Spaska Tarandova presented the work of the foundation and together with the board of ALL DIGITAL discussed ways to collaborate to enhance digital skills for all Europeans.